Auto-redirecting is the technique of automatically sending a site visitor to another page once s/he has landed on a page. The other page is often on the same website, but it can be on a different site altogether. In fact, auto-redirecting is used when a website has been set up for the sole purpose of ranking highly in the search engines. When visitors arrive at a page on the site, from a listing in the search engine results, they are automatically redirected to the main site. On-site auto-redirecting is common when a page, within the site, has been created specifically to rank highly in the search engines, but has been so highly optimized that it is no good for people to actually see. 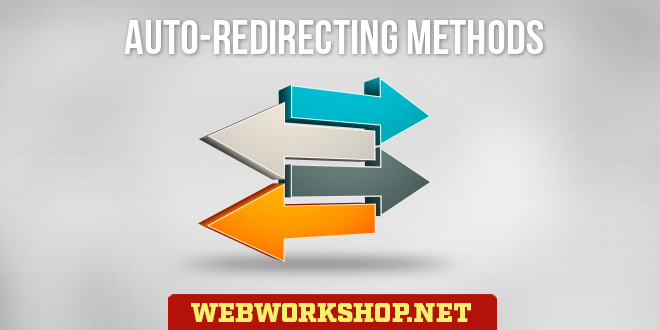 Auto-redirecting takes visitors to the ‘proper’ page within the site. Both of those uses are not wanted by the search engines, and they sometimes penalise a page or site for doing it. Fortunately, the engines are not able to automatically detect most of the auto-redirecting methods. The engines are not against auto-redirecting when it is done for they what consider to be a valid reason. E.g. when you have posted a message in a forum, you often get a confirmation page which will wait a few seconds and then auto-redirect you to the messages. This is the one auto-redirecting method that the engines can automatically detect, or so it is believed. It is also the one method that the engines are perfectly happy with as long as there is a reasonable delay between landing on a page and being redirected from it. At least 5 seconds is recommended. The “content” parameter contains two parts, seperated by a semi-colon. The first part is the delay, in seconds, before the redirection occurs. The second part is the URL to redirect to which, like any hyperlink, can be a relative URL (as above) or an absolute URL. For search engine optimization purposes, a delay in the auto-redirection is not usually desirable. Using the Meta Refresh Tag with a delay of 0 (zero) seconds is not recommended, because search engines can read HTML, Meta tags are HTML, and people have had penalties from redirecting that way. For an immeditate redirect, one of the other auto-redirecting methods is much better. “pagename.html” can be any relative or absolute URL, just like a hyperlink URL. Spiders can’t fill form fields in, and so they make no attempt at submitting forms, which means that forms can be used for auto-redirecting. What isn’t generally realised about forms is that the URL in a form’s ‘action’ parameter is just a URL that the browser requests from the server. It is given special treatment by the browser by adding some name=value pairs to the requested URL, but if none exist, the browser will still make the request for the URL. “myform” can be any name and “pagename.html” can be any absolute or relative URL. If a few seconds delay is acceptable to the functioning of the site, then the Meta Tag Refresh method of auto-redirecting is by far the best one to use, because search engines don’t object to it.